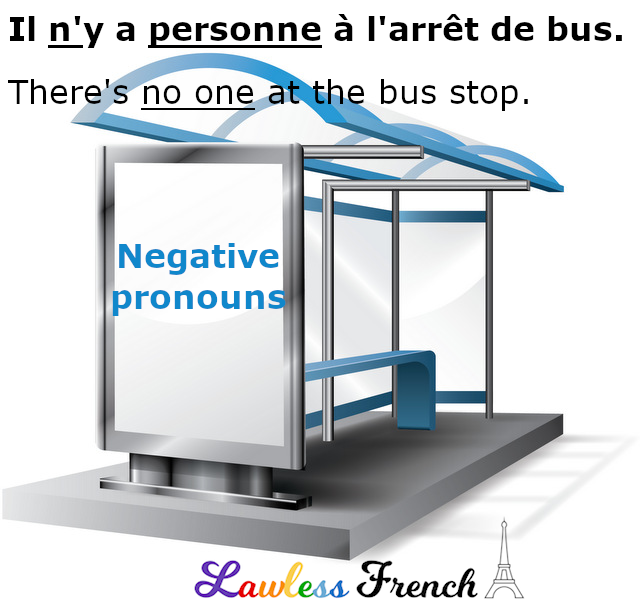 French negative pronouns, also called indefinite negative pronouns, replace and simultaneously negate nouns. Negative pronouns may be the subject or object of the verb they’re used with. Je ne connais personne ici. I don’t know anyone here. Rien n’est sur la table. Nothing is on the table. When the negative pronoun is the subject, the main negative word goes first, followed by ne and then the verb. Personne ne sait où aller. No one knows where to go. Rien ne s’est passé. Nothing happened. When the negative pronoun is the object of a preposition, ne precedes the verb and the main word follows the preposition. Tu n’as parlé à personne. You didn’t talk to anyone. Il n’a peur de rien. He’s not afraid of anything. When serving as a direct object, ne still precedes the verb, but the word order is somewhat different for the two pronouns. Je ne vois personne. I don’t see anyone. Je ne mange rien. I’m not eating anything. Je n’ai vu personne. I didn’t see anyone. Je n’ai rien mangé. I didn’t eat anything. Je ne peux voir personne. I can’t see anyone. Je ne vais rien manger. I’m not going to eat anything.